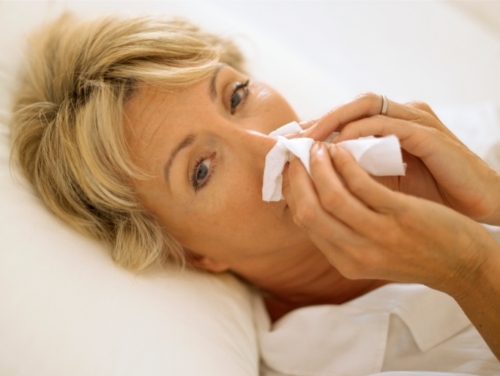 One of the most common illnesses experienced today is the common cold and flu. Now that fall has arrived, you’ll probably begin to notice more people sneezing, coughing, and complaining of sore, scratchy throats and runny noses. Other common symptoms include headaches, muscle aches, nasal congestion, a mild fever, fatigue, appetite loss, and swollen lymph glands. In the U.S., it is estimated that a common cold can lead to nearly 100 million medical visits every year! Once you start to develop a cold, what do you do? I used to run to the drug store at the first sign of a cold and purchase over-the-counter drugs, such as decongestants, acetaminophen (Tylenol), cough medicine, or lozenges for my sore throat. Keep in mind that your cold symptoms are merely a defense mechanism against bacteria or infections in the body. It can also be considered a natural cleansing process that helps rid the body of unwanted toxicity. When symptoms are suppressed with over-the-counter-drugs, you are basically prolonging your cold, and weakening your long-term health. People may also believe antibiotics are the answer; however, they are also not known to kill the virus responsible for your cold. Vitamin C (ascorbic acid) is a critical nutrient to ensure proper function of the immune system. Better results are usually obtained from larger doses of vitamin C. In a 2004 review of 29 clinical trials published in the Cochrane Database of Systematic Reviews, 200 milligrams (mg) of vitamin C reduced the cold duration in adults by eight percent and 14% in children. The meta-analysis included 11,077 participants. Large, therapeutic eight-gram doses of vitamin C after the onset of cold symptoms seemed to have a greater effect than four-gram daily doses. Vegetables high in vitamin C can also support the immune system in conjunction with supplementation. Excellent sources of vitamin C include broccoli, parsley, cauliflower, spinach, celery, collard greens, Swiss chard, lemon juice, and asparagus. Zinc is also an important nutrient for immune support, and zinc or zinc lozenges can be taken for prevention and treatment of the common cold. In another Cochrane review conducted in 2013, zinc reduced cold symptoms and the duration of colds in healthy people within 24 hours after the onset of symptoms. The review included two prevention trials and analyzed 16 studies with 1,387 people. The zinc supplementation lowered cold symptoms by 55% over a seven-day period when compared to people who didn’t consume zinc. Regular zinc intake also reduced the cold occurrences by 36%. The adequate intake of zinc for colds is considered at least 75 mg per day or more. Herbs can also be very beneficial for cold prevention and treatment. Echinacea can reduce your chances—as well as duration—of a cold infection. There have been many studies to support the use of echinacea for cold season. I recall a meta-analysis published in The Lancet Infectious Diseases. Researchers from the University of Connecticut School of Pharmacy found that echinacea effectively lowered the length and occurrence of the common cold. It reduced cold duration by 1.4 days and the chances of a cold developing by 58%. Other good herbal choices include Pelargonium sidoides, elderberry, thymus extract, ginger, garlic, American ginseng, wild indigo, thuja, agrimony, horseradish extract, cinnamon, dandelion, mullein, red marine algae, maitake mushroom, cranberry, Chinese skullcap, and cordyceps. Peppermint, eucalyptus, and oregano are also considered effective essential oils for your cold. Vitamin C, zinc, and echinacea are generally just the tip of the iceberg for common cold prevention. Probiotics provide the body with good bacteria that help prevent colds. The immune system can also benefit from other antioxidants such as vitamin A, vitamin E, and selenium. Carotenes, vitamin D, folic acid, iron, and B vitamins are also very important for immune support. These nutrients can be obtained through supplementation or a diet high in vegetables, non-gluten whole grains, nuts, seeds, and legumes. It is also best to avoid alcohol, sugar, and dairy products when you are sick. Even processed fruit juices contain large amounts of sugar, which suppress the immune system by decreasing white blood cell function and vitamin C levels. Some common homeopathic remedies used for colds include euphrasia, pulsatilla, nux vomica, arsenicum, allium cepa, phosphorus, and natrum muriaticum. Enhance your immune system with plenty of rest and relaxation. Consume an abundance of liquids, such as water, unsweetened herbal teas, homemade soups (bone broth is most beneficial), and smoothies with several vegetables. Murray, M., et al., The Encyclopedia of Natural Medicine (New York: Atria Paperback, 2012), 169-182, 435-441. Hershoff, A., Homeopathic Remedies: A Quick and Easy Guide to Common Disorders and Their Homeopathic Treatments (New York: Penguin Putnam Inc., 1999), 128-129. Balch, J., et al., Prescription for Natural Cures: A Self-Care Guide for Treating Health Problems with Natural Remedies Including Diet, Nutrition, Supplements, and Other Holistic Methods (Hoboken: John Wiley & Sons, Inc., 2004), 171-175. Douglas, R.M., et al., “Vitamin C for preventing and treating the common cold,” Cochrane Database of Systematic Reviews, 2007; (3): CD000980. Signh, M., et al., “Zinc for the common cold,” Cochrane Database of Systematic Reviews, 2015; 6: CD001364. Adams, C., N.D., “Yes Dear, Garlic, Vitamin C and Zinc Do Treat the Common Cold,” GreenMedInfo.com, December 3, 2014; http://www.greenmedinfo.com/blog/yes-dear-garlic-vitamin-c-and-zinc-do-treat-common-cold. Robinson, P., “43 Natural Alternatives for Colds and Flu,” GreenMedInfo.com, June 4, 2012; http://www.greenmedinfo.com/blog/43-natural-alternatives-colds-and-flu. PubMed Health, “Common Cold,” U.S. National Library of Medicine web site; http://www.ncbi.nlm.nih.gov/pubmedhealth/PMH0001698/, last accessed September 28, 2015. “What are the medicines and treatments for a cold?” NPS MedicineWise web site; http://www.nps.org.au/conditions/respiratory-problems/respiratory-tract-infections/for-individuals/conditions/common-cold/for-individuals/medicines-and-treatments, last accessed September 28, 2015. Shah, S.A., “Evaluation of echinacea for the prevention and treatment of the common cold: a meta-analysis,” Lancet Infectious Diseases, 2007; 7(7): 473-480. “Common Cold,” MedicineNet.com; http://www.medicinenet.com/common_cold/article.htm, last accessed September 29, 2015.